Almost half of Member States have reached the Europe 2020 target of 40% of people aged 30-34 holding a higher education degree or equivalent qualification, according to the latest data. Since the target was announced in 2010, progress has been steady, rising by around one percentage point a year. If current trends continue, the European Union should meet its target by the end of the decade. Increasing the level of educational attainment of the labour force is a major EU objective. A highly skilled European workforce is fundamental to Europe’s global competitiveness and a driver of economic growth and prosperity. It is seen as the key to unlocking Europe’s potential for research and innovation. It is also necessary as most new jobs created in the future are expected to be highly-skilled. As well as the Europe 2020 target, almost all Member States have set their own targets for 2020, taking into account national circumstances and policy objectives. More Europeans are pursuing higher levels of education than in previous generations. This is leading to significant shifts in attainment levels over time within European countries. Older cohorts of workers with low educational attainment are steadily leaving the workforce and being replaced by better educated younger generations. 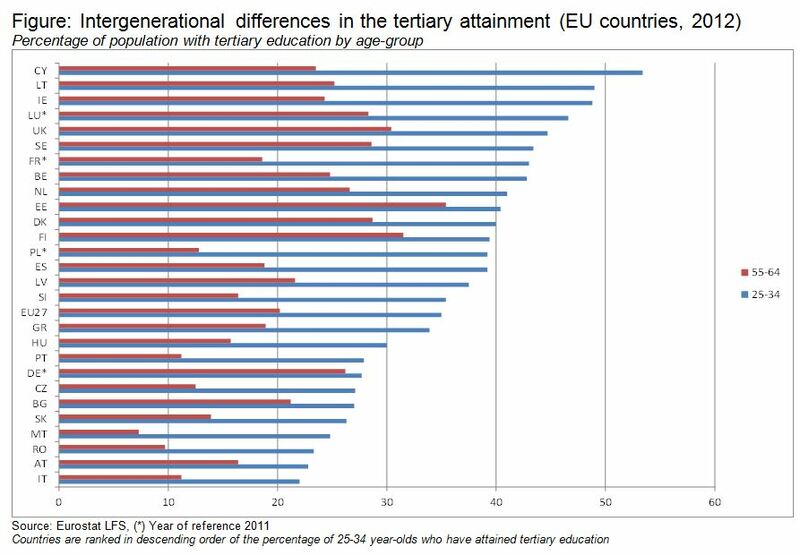 In 2012, in all Member States, the proportion of young people aged 25-34 with tertiary education is markedly higher than that of adults aged 55-64 (see Figure). There are large disparities between men and women. Data show notable progress for women since 2000, who have outpaced men and now, overall tend to be better qualified in nearly all Member States. However, in maths, science and engineering the gender gap has increased in the past years at European level. Significantly more men than women graduate in these subjects, which are in high demand on the labour market and will continue to gain in importance (1). Cedefop’s latest skill supply and demand forecasts indicate that, overall in Europe, numbers of people with tertiary-level qualifications will continue to rise and will account for some 37% of the labour force in 2020. However, owing to the economic slow-down demand for highly-skilled workers is forecast to lag behind supply and may lead to people taking jobs for which they are over-qualified in the short term (2). Skill mismatch has been increasing in the EU, further augmenting the labour market difficulties as a result of the economic crisis. Today, one in three European employees is either over- or under-qualified for the job they are doing. Mismatch is especially high in Mediterranean countries (3). Data also show that over the past decade the rate of over-qualification in the EU has risen by about 5%, meaning that around 6.4 million Europeans have taken jobs in recent years for which they are over-qualified (4). Today, roughly 20% of people aged 25-34 with tertiary education are employed in occupations typically not requiring tertiary qualifications. Despite the growing participation rates in tertiary education this proportion has remained quite stable over the past decade, suggesting that the over-qualification rates are influenced more by labour market structures and innovation than by the increasing number of tertiary level students. The statistics presented in this publication show the percentage of population with tertiary education. A particular focus is on the EU headline indicator in the field of education and training showing the tertiary attainment of the 30-34 years old. The indicators are collected through the EU Labour Force Survey (LFS). Ireland outperforms European averages for both EU indicators (early school leaving rate (5) and tertiary-level education completion rate for 30 to 34 year olds). Ireland’s early school leaving rate dropped systematically in recent years to 10.2% in 2012, compared to the EU average of 12.9%. The decrease has been across different groups. Male and female, whether native or foreign-born all have comparatively low early school leaving rates. Ireland is also the best European performer for people completing tertiary level with a rate of 51%, compared to the EU average of 35.5% in 2012. Ireland is closing in on its national target of 60% by 2020. Among the reasons for this strong performance are high and increasing investment in education as a proportion of GDP, more supportive family environments (Ireland has a higher proportion of women aged 55-64 that have completed tertiary education than the EU average) (6) and strong incentives for young people to stay on in education. Progress in the proportion of the population aged 30 to 34 attaining tertiary level education over the past decade in Ireland was also impressive, rising from 27.5% in 2000 to 51% in 2012. This increase was complemented by Ireland attracting large numbers of highly-educated people from abroad. Factors contributing to this performance include above average upper- secondary completion rates (86.5% compared to EU average of 80% in 2012) and high investment in tertiary education (1.3% as a proportion of GDP in 2010). (5)Persons aged 18 to 24 fulfilling the following two conditions: first, the highest level of education attained is ISCED 0 or 1, or 2 or 3c short, and second, the respondents declared not having received any education or training in the four weeks preceding the survey (numerator). The denominator consists of the total population of the same age group (18-24), excluding no answers to the questions "highest level of education or training attained" and "participation to education and training". Both the numerators and the denominators come from the Labour Force Survey.